Despite its name winter squash is a summer crop. Like all the cucurbit family including cucumbers, summer squash, and melons, winter squash loves warm weather and dies with frost. The many varieties are called winter squash because they form a hard shell and will keep sometimes for months in a cool, dry place. My pantry has high humidity and I can keep winter squash there for four to five months. This isn’t listed as a winter squash, but acts like one. This is a Chinese winter melon. The seeds are difficult to get. 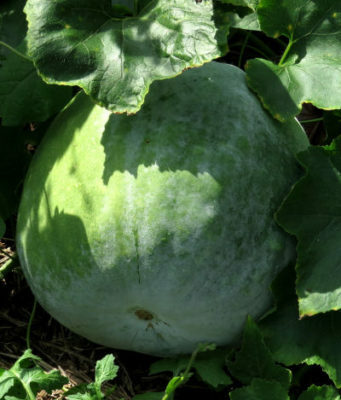 The melon has a light green, firm flesh with very mild taste. I’m told that, once the white hair haze covers the melon, it will keep for months. It can be eaten at the immature stage like summer squash. A few years ago I reorganized my garden into beds. These are a generous four foot by ten foot. All the vegetables I grow do very well in these beds. 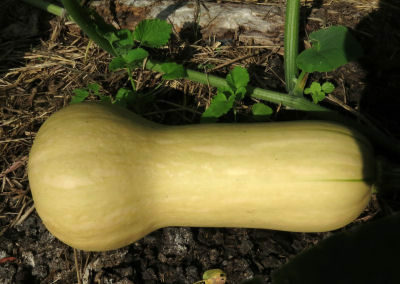 Summer squash forms a large, bushy plant. It sprawls a little. My plants do get big enough to demand an entire bed for two or three hills. Years ago I tried a Kabocha squash from the market and liked it. The variety this year is like the store one. It had orange flesh and a sweet, moist taste. This year I grew kabocha and butternut winter squashes. The kabocha grew up and over the pea trellis. Branch vines drooped off the edges spreading out through the bean trellis and across the summer squash. The butternut plants were planted late in July. The heat and dryness held the plants back even with supplemental watering. Rain revived them. the vines remained smaller than usual, but still overran the bed and invaded the garlic chives across the pathway. Waltham Butternut is an heirloom winter squash. There is at least one modern hybrid, but I prefer the old standard. The vines grow fast and load up with squash. 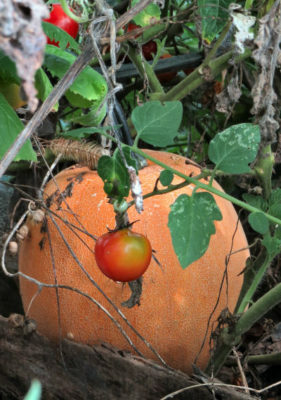 It has a firm, deep orange flesh with the seeds at the rounded end. the goats love the peelings and seeds. They will eat the squash too. The prize for exceeding its bed goes to two Winter Luxury pumpkin vines. Pumpkins are a variety of winter squash. These vines engulfed their bed, the neighboring summer squash, the hollyhocks, covered the raised bed including the cherry tomatoes there. Still not satisfied, the vines went out through the fence and spread out into the orchard. The vines can be trimmed. I hesitate to do so as the squash bugs move in and devastate the vines. Unlike summer squash that quickly succumbs to squash bug attacks, winter squash has a survival tactic. Those long vines root at the leaf nodes. The extra roots help the vines survive long enough to ripen the squash. And that is the big reason to plant winter squash. Each variety is different from the others in taste and texture. I like kabocha and butternut, but not buttercup. Acorn will do in a pinch. Spaghetti squash is not on my menu. Pumpkins are another story. I love pumpkins. And those monster vines are busy ripening a few nice pie pumpkins for me. 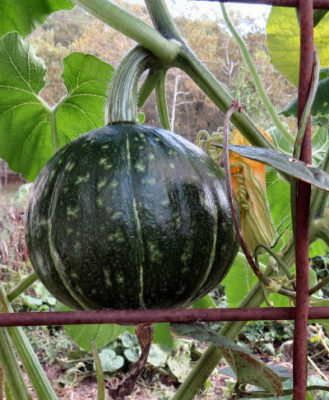 This entry was posted in High Reaches and tagged gardening, growing winter squash, pumpkins on October 10, 2018 by [email protected].